Click here for single column of the jobs in alphabetical order. Enter the census county as "Sussex"
The last step will allow you to enter the Census Town as "Brighton"
Another is Charles SNELLING of 58 Princes Rd (born in Sussex). lets you fill in the street name. Take care to shorten "Princes Road" to "Princes Rd" (as above). The birth county is optional. In 1891, there were at least 18 households acting as laundries in Princes Road. See illustrated article identifying them. On the north side at the summit of the hill, there were four of them. The L-shaped garden of No 53, truncating a few of the gardens to the west, provided plenty of space for drying. The lower floor of No 48 - the gabled flint house (just west of the cul-de-sac now known as "The Copse") built in 1875, was used over several owners as a laundry. No 48 was renumbered as No 50 in 1895 when a narrow extension was added (also gabled and in flint). [a] Occupations in order of house numbers 1 - 76 (odds N side and evens S side, though the last listed job "Railway Signalman" relates to railway cottage on the N side at the east end of Princes Road. Notice the frequency of railway related jobs as well as laundries. In 1891, the term "scholar" generally relates to childen aged between 4 and 12 either receiving daily schooling or home tuition on a regular basis. Professor of Music, Needlewoman, Dressmaker, Scholar, Foreman Telegraph Works, Scholar, Scholar, Scholar, Scholar, Journalist Reporter, Bootmaker, Errand Boy, Scholar,Scholar, Assistant in Estates Office, Milliner, Wool Worker, Art Gallery Assistant, Railway Engine Driver, Dressmaker,Hotel Waiter, Solicitors Clerk, Scholar, Scholar, Gardener, Drapers Assistant, Cashier, Scholar, Scholar, Railway Warehouse Clerk, Scholar, Scholar, Scholar, Scholar, Tinsmith, Chemists Assistant, Boiler Makers Assistant, Passenger Guard LBSC Railway, Scholar, Scholar, Scholar, Scholar,Telegraph Messenger, Railway Porter, Scholar, Scholar, Clerk Railway Booking, Railway Porter, Carpenter House, Railway Guard, Railway Guard, Railway Guard LBSC Railway, Boiler Maker Holder Up, Printers Apprentice, Scholar, Scholar, Scholar, Scholar, Dressmaker, Railway Ticket Collector, Scholar, Signalman, Servant, Railway Ticket Collector, Solicitors Shorthand Clerk, Railway Guard, Railway Clerk, Scholar, Railway Clerk, Railway Guard, Scholar, Scholar, Living On Own Means, Printers Apprentice, Scholar, Scholar, Scholar, Engineers Assistant, Boot Maker, Kitchenmaid Domestic, Messenger, Scholar, Scholar, Scholar, Scholar, Caretaker Board School, General Agent, School Master, Boilermaker Railway Works, Carpenter Railway,Railway Porter, Coachmakers Apprentice, School Teacher, Timber / Firewood Merchant, Scholar, Scholar, Scholar, Foreman Railway Wagon Makers, Railway Carriage Maker, Dressmaker, Scholar, Scholar, Railway Porter, Scholar, Auctioneers Porter, Scholar, Laundress, Painters Apprentice, Scholar, Scholar, Bricklayers Labourer, Railway Guard, Living On Own Means, Engine Boiler Maker, Scholar, Scholar, Dressmaker, House Painter, Laundress, Scholar, Scholar, Scholar, General Servant, Boot Maker, Laundress, Laundress Assistant, Scholar, Engine Fitter, Engine Fitters Apprentice, Laundress, Carpenter House,Tailor, Railway Porter, Scholar, General Servant, Carpenter House, Brush Maker, Scholar, Scholar, Time Keeper Railway Works, General Servant, Scholar, Scholar, Scholar, Scholar, Scholar, Living On Own Means, Bricklayers Labourer, Teacher in Grammar School, Dressmaker, Laundryman, Laundress, Laundress, Carpenter House, Brewers Clerk, Scholar, Scholar, Scholar, House Painter, Laundress, Living On Own Means, Laundry Man, Laundress, Water Meter Inspector, Clerk Estate Agents, Scholar, Laundryman, Laundress, Fireman Railway, Fireman Railway, Laundry Maid, Engine Driver, Scholar, Laundress, Potman, Ironer, Ironer, Scholar, Scholar, Scholar, Labourer Corporation, Scholar, Insurance Agent Life, Rubber Medical, Photographer,Clerk Drapers, Hair Dresser, Clerk Engineers, Foreman Of Dust Carts, Scholar, Scholar, Scholar, Scholar, Printers Clerk, Joiner Building Trade, Joiner Building Trade, Tailoress, Gardener, General Labourer, Laundress, Living On Own Means, Gardener, Scholar, Scholar, Scholar, Scholar, Police Constable, Labourer, Platelayer, Charwoman, Scholar, Living On Own Means, Nurse, Scholar, Scholar, Railway Signalman, Errand Boy, Scholar, Scholar, Scholar, Scholar. Opposite the north end of Crescent Road, they were built in 1867, one year after Princes Villa was erected. It took some years before the west side of Crescent Road was further developed. The east side (without such a rise in ground level) was developed earlier - there was probably less excavation to do for building foundations. The Primrose and Tivoli laundries do not arrive at 20/22 and 28 Crescent Road until 1898. The generous strip of drying field on one of the highest terrains in Round Hill (good for catching the wind) probably offered incentive. One of the challenges of current 2019 development - the building of two new houses on this strip - has been excavation i.e. sinking the lower floors of the new homes into the ground to minimise overlooking involving extisting homes & back gardens. Facebook pictures of the railway cottage and the signalbox. About 30 residents in Princes Road had jobs related to the railway in 1891. The cottage belonging to the signalman was located at a lower level on the site now owned by Billings and Hathaway set back a little from what is now the end of The Centenary Industrial Estate. Its back garden extended westwards ending at the signal box (also set at a lower level than Princes Road) just outside the NE corner of what is now the Carelet site. The last occupant of railway cottage was Ron French who kept it on after he retired from the railway. He then used the signalbox as his workshop. Both cottage and signalbox were demolished when he moved in 1989 to make way for the final units on the newly built Centenary Industrial Estate. 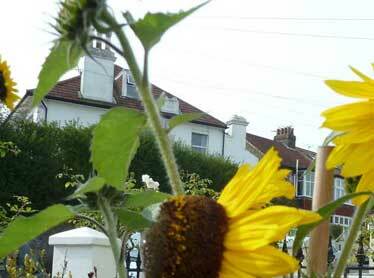 The latter followed the path of The Kemptown branchline. 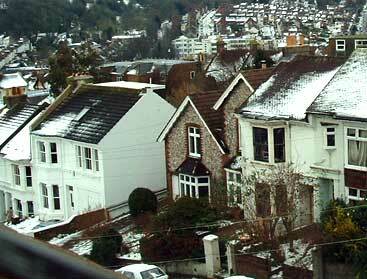 The residents on the opposite side of Lewes Road fared better than us. Thanks to the campaigning efforts of Councillor William Clarke, instead of an industrial estate, the path of the abandoned railway was used as public parkland - a green strip now known as "The Patch" or William Clarke Park. See their Facebook Site. Best when you have a public asset like this to celebrate it through an annual festival to prevent those seeking strips of land for other purposes from getting ideas! This large house was built in 1866 for James Stapleton (senior) shown in the 1871 census as owner of an eating house at 71 North Road Brighton. Although his son (another James) occupied this villa in its early years, James Stapelton Senior is shown in the 1891 census as living out the last few years of his life at Princes Villa,which by this time has its main entrance to the detached villa as No 2 Crescent Road. This unusual building, first a stables, has more recently been occupied by people - past street directories show owners who were possibly resident, though more recently occupants have been several small businesses: Zebra Brakes moved here from 48 Princes Road circa late 1970s (one could hear their telephone ringing several houses away). They were followed by an enterprise which undertook paint-spraying - moved on (I recall) for environmenal health reasons. A longer-term occupant was Floline plumbing - popular with many residents, though drawing rather large delivery vans, competing for limited on-street parking space. Albion Plumbing is the current occupant. 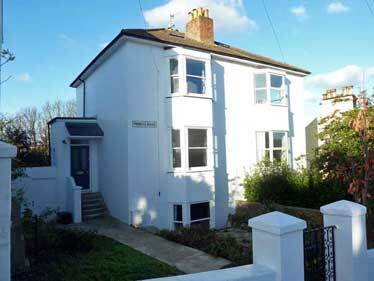 These homes were built on land originally belonging to Princes Villa, but in the mid 1920s. They appear as "Hillcrest" and "Coliemore" in Pike's 1926 Brighton and Hove Street Directory while 36A (what was the stables in 1891) appears as "Sinal" belonging to Mrs Olive Smeed. The extension - the taller and narrower of the flint gables higher up the hill - was planned as a purpose-built laundry under Mrs Richardson after several owners had used the wider gabled section as a laundry. 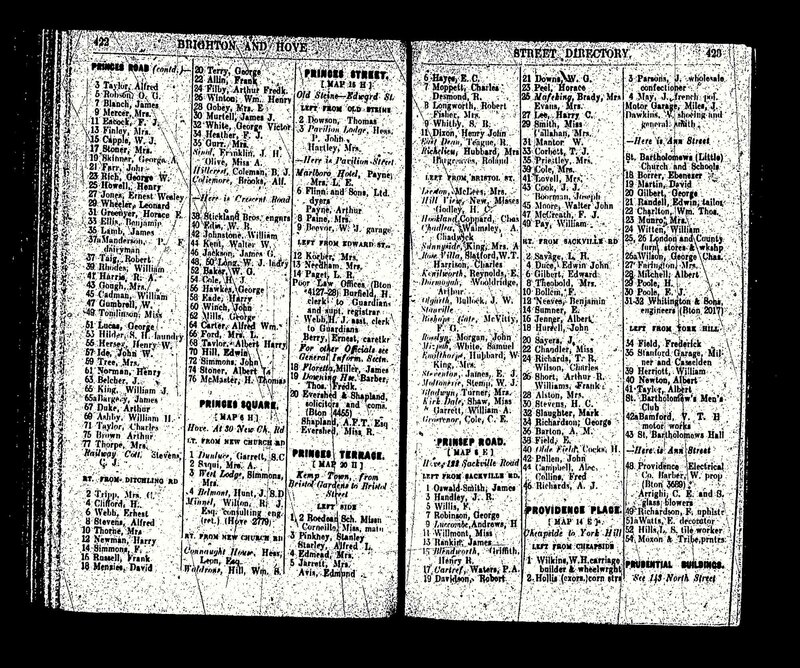 The street directories (linked to at the foot of this page) show that 48-50 remains is still being used as a laundry under W.J. Long in 1929 (plenty of space in the Copse for drying) see Pikes Street Directory. No 50 was later lived in by Mr Fisher, owner of te golf ball factory within the large semi-detached villa at 21-23 Richmond Road. Try the Golf Ball Factory Quiz on this site or click on the picture below for a gap full puzzle which offers more information about the six grand semi-detached villas on the north side of Richmond Road erected in the 1860s. 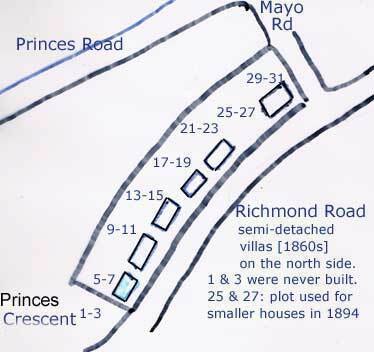 Notice the geography of 21-23 Richmond Road in relation to the original 48 Princes Road, built as Hill Cottage in 1875 so not present on the plan below. Mr Fisher, who owned several local properties, let out the extension to small businesses. The extension at No 48 has since been a tie factory and home to Zebra Brakes (brake lining service), though more recently it has been enjoyed as a home both by a relative of Mr Fisher as well as by other residents drawn to the character of the building as well as evidence of a friendly and active community. House building in Princes Road gathered pace in the 1880s, so the 1891 census provides a good guide to the socio-economics of the street. Notice that there was only ONE servant recorded in Princes Road at this time, though family size (several households accommodated extended families) do not indicate a shortage of labour. The 1891 census records a population of 334 residents in Princes Road. 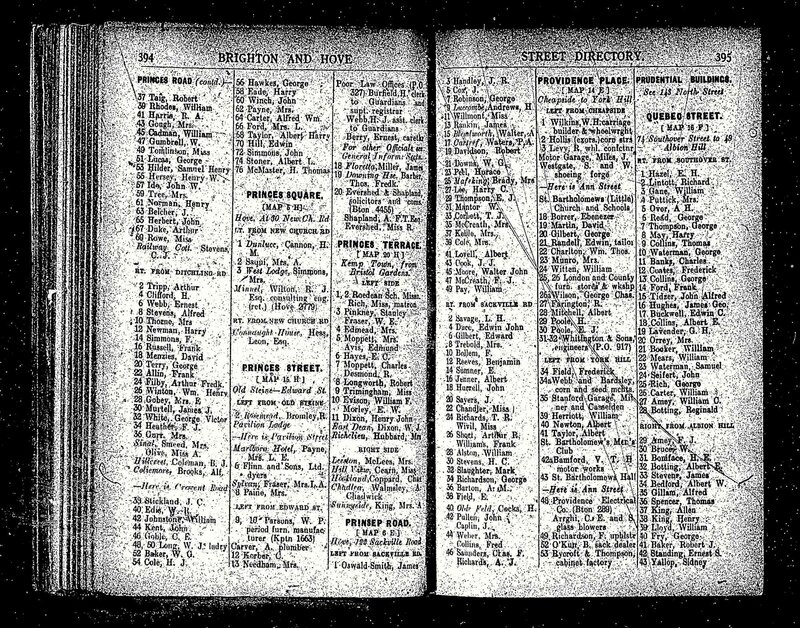 Directly below are some earlier and later street directories, followed by the list of occupations in 1891. Click on "the year" to go to the directory. Then click on the directory once or twice to enlarge.